'Tight' and 'light' were the main descriptors used by sailors at Sailing World Cup Weymouth and Portland as challenging conditions continued across the London 2012 Olympic waters. The light breeze ensured Friday's racing was challenging and tense across the fleets that were able to race in the morning. All fleets came ashore at 13:20 with only the Men's and Women's 470, 49er, Finn and Nacra 17 completing races in the morning session. At 16:00, the 49erFX, Men's and Women's RS:X, Laser and Laser Radial fleets went out onto the water and all but the 49erFX got some racing in. It's fair to say the day was a tough one for all of the 330 sailors from 43 nations racing across the ten Olympic fleets. Saturday's schedule sees 33 races on the agenda as the Race Committee look to catch up on lost races. Dylan Fletcher and Alain Sign (GBR) thrived in the light breeze, snapping up a first and a second from two 49er races. They lead on 17 points and are five clear of Poland's Lukasz Przybytek and Pawel Kolodzinski. Every athlete heading to the Olympic Games is nearing their peak physical and mental fitness. Weymouth and Portland gives the sailors one last chance to test themselves before the summer showcase. French Rio representatives Julien d'Ortoli and Noe Delpech have found their feet in Weymouth and Portland and after the Brits took the first race win, they claimed the second. They sit in fourth overall and are enjoying racing in a competitive 30-boat fleet. "Everybody is sailing well,” explained d'Ortoli, "and they are definitely ready for the Olympics so the competition is tough. The French team are ahead of many Rio medal hopefuls such as Jonas Warrer and Christian Peter Lubeck (DEN), Nico Delle-Karth and Nikolaus Resch (AUT) and Ryan Seaton and Matthew McGovern (IRL) giving them a huge confidence boost. "It's the last regatta before Rio so just being in front of people is good for the spirit if nothing else,” concluded d'Ortoli. The 49erFX endeavoured to get a race in but it was just not to be. Sweden's Lisa Ericson and Hanna Klinga will take their lead into the fourth day of racing. Overnight leaders Sofian Bouvet and Jeremion Mion of France fell victim to the day's challenging conditions and were black flagged in the single Men's 470 race. They now count their 21st from the day prior and drop down to tenth overall. They weren't the only top team who fell victim to a black flag. Jordi Xammar and Joan Herp (ESP), Mat Belcher and Will Ryan (AUS) and Yannick Brauchli and Romuald Hausser (SUI) were all hit and drop down. Luke Patience and Chris Grube (GBR) were the winners of the day, taking the single race victory in a convincing manner. They grabbed an early advantage and never looked back, sealing the win by 50 seconds over Croatia's Sime Fantela and Igor Marenic. As a result, the Brits are on top on nine points followed by the Croatians on ten. Carl-Fredrik Fock and Marcus Dackhammar follow on 14. In the Women's 470, the overnight tie between the top three has been split but the margin between first and third sits at just two points. A third in the single race by Sophie Weguelin and Eilidh McIntyre (GBR) gives them the advantage. They are followed by compatriots Hannah Mills and Saskia Clark and Switzerland's Linda Fahrni and Maja Siegenthaler. 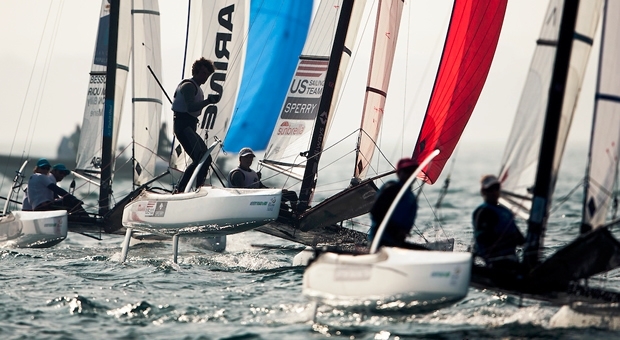 Weymouth and Portland is the final event for the German Nacra 17 sailors to clinch the Rio 2016 berth. Beat your national rivals and finish in the top ten, you're in. Claim the overall title, consider yourself a Rio 2016 contender. Paul Kohlhoff and Carolina Werner (GER) are on track to do exactly both after a solid third in the single Nacra 17 race promoted them to first overall. Kohlhoff and Werner have been involved in a long-running selection battle with their compatriots Jan Hauke Erichsen and Lea Spitzmann as well as Stefan Rumpf and Anna Bettina Goos. Weymouth and Portland is the decider and pressure can often be an assumption but it is certainly not the case for Werner as she explained, "The selection process has been going for half a year so we are used to it now. The Germans are one point ahead of overnight leaders Luke Ramsay and Nikola Girke (CAN) and two ahead of Ben Saxton and Nikola Groves (GBR). Things just keep getting better and better for Hungarian youngster Maria Erdi. After winning gold at the 2015 Youth Sailing World Championships, Erdi qualified for the Rio 2016 Olympic Games at the tender age of 18 earlier this year at the final qualification event. The Laser Radial fleet in Weymouth and Portland features all the major contenders for Rio 2016 and they are looking to get one up on their rivals ahead of the summer showcase. Sailing without pressure or expectation around the world class competition, Erdi picked up the only race victory of the day, beating London 2012 silver medallist and two-time World Champion Marit Bouwmeester. "At the first mark we were all very close. Marit, Evi [van Acker of Belgium], Tatiana [Drozdovskaya of Belarus]. Lots of good people around me and I just tried to concentrate on my own downwind, and it worker because I gained a lot,” explained Erdi. "I was leading quite a bit after the first downwind and on the upwind I was just trying to defend my position. There was a part when the wind stopped and I got really nervous. But luckily I stayed in front and won. Bouwmeester's second pushes her up to first overall on six points, Lijia Xu (CHN) follows on 13 with Erdi on 15. The Laser fleet hit the shore at 19:00 local time and Australia's Tom Burton held firm with a second to retain his overall lead. Jesper Stalheim (SWE) and Nick Thompson (GBR) followed in third and fourth and occupy the final podium positions. Sweden's London 2012 Olympic Star gold medallist Max Salminen (SWE) found his groove in the light breeze, taking the single race victory to move into third overall. Salminen grabbed the lead after the second mark rounding and pulled ahead of his competitors to claim a comfortable 18 second victory over Tapio Nirkko (FIN). Giles Scott's training partner in the build-up to the Rio 2016 is Ben Cornish and he's proving to be a worthy one, snatching the lead off of Scott. Cornish's third to Scott's fifth gives him a two-point lead. China's Peina Chen continued her dominance in the Women's RS:X with two further race wins. Chen, the 2015 Women's RS:X World Champion, is five points clear of Isobel Hamilton (GBR) who finished second in both of the day's races. In the Men's RS:X, Toni Wilhem (GER) moved up to first overall following a pair of race victories. The German is now seven points clear of Chunzhuang Liu (CHN) and a further two ahead of Aichen Wang (CHN).